Everlasting Moments was Sweden's official submission for the 2009 Academy Awards, and it's further proof that something was rotten in the Oscar pool that year for the Japanese film Departures to have taken the statue. Jan Troell's movie is a fully realized portrait of a working-class Swedish family doing everything they can to get by and to survive the violence and anger that sits at the head of their dinner table. The narrative begins in 1909 and spans across World War I, though the external strife of political upheaval and bombshells has nothing on the internal strife of the Larsson family. It's like a companion piece to Bergman's Fanny & Alexander, just without all the mysticism. Maria and Sigfrid Larsson (played by Maria Heiskanen and Mikael Perbrandt) already have four kids when the movie starts, and by the end of it they have seven. The story is told by little Maja (Nellie Almgren for the early scenes, Callin Öhrvall for most of the movie), the eldest girl in the family. She is a watchful child, saying more in narration than she does in the events she relates. The Larsson apartment is cramped but they muddle through. Maria takes in sewing and other odd jobs, and Sigfrid works down at the docks. They are members of the neighborhood Temperance Society whenever Sigfrid manages to stay sober, and when he doesn't, look out! The brawny papa gets loud, likes to make his kids sing for his entertainment, and doesn't mind issuing punishment to those who get in his way. Sigfrid is a bit of a lost soul, his head swayed as easily by politics as it is turned by a woman. His flirtation with Socialism passes quickly enough, but his rough ways carry on. Maria first turns to conventional subjects, like her cat and her children, but the artistic bug bites her good. When a neighbor asks her to take a photo of her deceased child before the funeral, Maria not only realizes that she can use her camera for positive things (including making money), but she also shows that she has a gift for knowing the right moment to grab her shot. Pedersen is especially touched by her work, and his validation touches her. It's one of the most tender of many tender moments between them. Theirs will be an ongoing affair, but one that never crosses a certain line. The only kiss the two share is the one Maria gingerly places on his cheek as a thank you. Though there is a will-they-or-won't-they quality to the Maria and Pedersen relationship, Everlasting Moments is not a will-they-or-won't-they romantic movie. Rather, it's a movie about loneliness and desire--and not necessarily the sort of desire that yearns to curb that loneliness with another person, but one that seeks to find solace in personal passion. For Maria, it is photography, and her bond with Pedersen--or Uncle Piff Paff Puff, as the kids end up calling him, based on his version of "Say cheese!" --grows out of their shared love of the captured image. He even takes up a movie camera and shows her the wonders of the moving image. The picture's most light-hearted family moment follows after Maria and the kids go to see a silent Charlie Chaplin comedy with Pedersen providing live violin music. When they go home, they draw on Chaplin moustaches and copy his routines. It's a lot of fun until Dad stumbles in and thinks they are making fun of him. The scene turns violent shortly after. Sigfrid is like a ticking time bomb in Everlasting Moments. There is not a quiet moment he can't explode. In some ways, he is a monster, but in others, he is the most tragically flawed of all the characters. Troell, along with main writer Niklas Rådström, who based the script on the memoir of Maja Öman, portrays Sigfrid as sympathetic, caught in the same jail as everyone else but cursed to flail harder against its metaphorical walls. He can't see the good in Maria's photography, nor can he see a positive future for his children when his second-oldest boy has an opportunity to enter religious study and Maja is offered a German tutorial. It's only after he rescues an abused horse in the street that Sigfrid comprehends what it means to have something outside of yourself to care about. He is said to have a gift for understanding horses, and only he could see that this one was worth saving. Though no one makes the connection in the movie, this also says a lot about his relationship with Maria. No one can understand why she keeps taking him back. She's the only person that can see he is worth saving. Maria Heiskanen and Mikael Perbrandt play their characters with quiet courage. They don't need to voice their pain, it's obvious in their bearing. Everlasting Moments is by no means a dour film, but its greatest moments of vulnerability are when the characters are allowing themselves to be happy, not when they share their sadness. The acting is flawless. In addition to directing the movie and contributing to the story, Jan Troell also shot Everlasting Moments alongside co-cinematographer Mischa Gavrjusjov. Not surprisingly for a film about a woman who is in love with images, Everlasting Moments replicates the look of old movies and photographs. Night scenes are often shot in natural light, so they look stark and grainy, while a couple of scenes are cast in sepia, reinforcing the importance of memory and how its preservation permeates everything. When Maria is developing her photos, the red glow of the dark room is really the crimson of an illicit tryst. Sigfrid is aware of it when he spies her working alone. It's this privacy that makes him a cuckold, not anything she might ever do with Pedersen. As far as the drama goes, there is much about Everlasting Moments that is fraught with emotion. A few scenes are harrowing and make your heart jump into your throat for fear they will go the wrong way. After all, we can't remember the good times without remembering the bad. Yet, it's the good that will ultimately out. Troell finds just the right way to close out his story, bringing this troubled family to a place of peace that is both heart-warming and logical. There is real growth here, and like life, it comes on gradually so that, as an audience, we are surprised when it happens while also knowing deep down that all is as it should be. 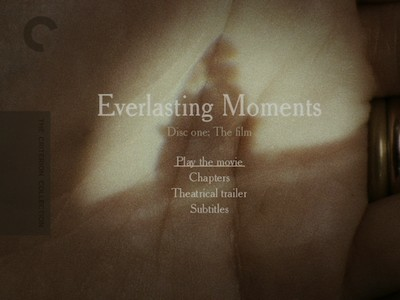 The Criterion Collection's DVD of Everlasting Moments sports a fabulous 1.78:1 anamorphic transfer that shows a diligent eye for maintaining the color balance required for this unique movie. Jan Troell oversaw the digital conversion, and so we get all the wonderful nuance of his photography, including the intense reds and appropriately muted sepia, but also the wonderful hues of the set design. The dark clothes, the almost burgundy bricks of the period buildings, the hazy light of early electricity, the peaceful gray of Pedersen's studio--it's all visible on this disc. The Swedish language soundtrack has been mixed in Dolby 5.1 and is as subtle in its construction as the period details in the image. There is a fine balance here between the spoken dialogue and Matti Bye's lovely musical score, but there is also a lot of care given to the sound effects and the tiny noises in the margins. While it's not a mix that ever jumps out at you, it does sneakily move around, creating depth in the audio that heightens the realism of the experience. The optional English subtitles are very good, with a pleasing writing style and natural pacing. DVD 1 features the full-length movie and the theatrical trailer. DVD 2 is reserved for supplements. As it turns out, Maria Larsson wasn't just a real person (the original Swedish title of the movie is Maria Larssons eviga ögonblick, or Maria Larsson's Everlasting Moments), but she is a distant relative of Agneta Ulfsäter-Troell, the director's wife and also the third writer contributing to the story. This real-life connection and a look at her actual photographs is the focus of the featurette "The True Story of Maria Larsson" (9 minutes, 15 seconds) and for part of the documentary "Troell Behind the Camera" (28 mins.). The former is actually narrated by Agneta Ulfsäter-Troell, who explains about the photos and shares some of the information behind them. The longer piece moves away from the source material and to the making of the movie, with Jan Troell letting us in on his process and sharing his obvious joy for moviemaking. 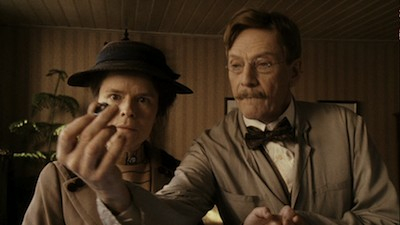 The director is also the full focus of the final extra, the hour-long feature Troell's Magic Mirror. This scholarly look at Troell's life and career reaches all the way back to his childhood and leads us into his rich cinematic life. It's not snappy by Hollywood standards, but the level of information is deep and worth the effort to watch it. Highly Recommended. 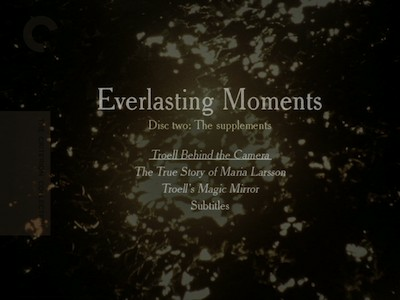 Jan Troell's Everlasting Moments is a gem of a film. This warm tale of one Swedish family and their struggles before and after WWI is a touching, tragic, and all-around beautiful tribute to the things that drive us to carry on and the secret parts of our souls that find something to love in the bleakest of circumstances. The film is led by a great performance from actress Maria Heiskanen, who plays Maria Larsson, an ancestor of the director's wife who held her family together through hard work but soothed her own troubled mind by taking photos. Spanning many years, Everlasting Moments goes deep into the dynamic of this rather large clan, leading them through changes that are both good and bad, and seeing how they come out on the other side.